Here's a question for you this lovely May weekend: What's an often-overlooked weapon in your arsenal as a creative person? For me, that oft-disregarded resource is exercise. In fact, I've written a whole essay about that in Friday's guest blog post over at the Breathe Writers' Conference blog. I hope you'll check it out. 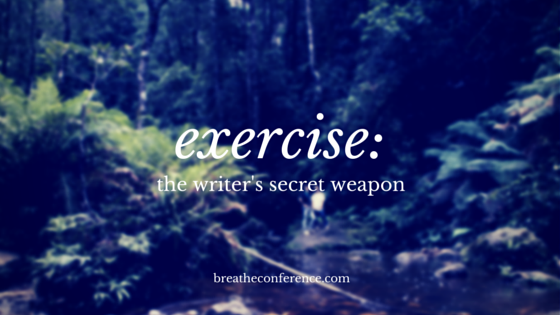 What is YOUR secret weapon for enhancing your writing life? It might be exercise. Or, it might be something else. I'd love to hear about it here in the comments or on the link to this post on my Facebook author page. Look for more of my Breathe guest blog posts in June and July at BreatheConference.com. I'll be writing about "How People Watching Feeds My Imagination" and "What Breathe Means to Me."